99/169 Max Braden Enjoyable only for kids of course, but it's watchable for adults. G-forces...pulling...us...down! I believe it was the immortal autobot Optimus Prime who uttered that phrase in an episode of Transformers from the original TV show. Why am I thinking of that line? There's an upcoming movie named G-Force, of course. This is a reach, I know. If professional drag racing’s Ashley Force was named G, this might be a movie about her, but there is no such luck here. This is an adventure pic, produced by the venerable Jerry Bruckheimer and featuring the voices of Nic Cage, Steve Buscemi, Penelope Cruz and Tracy Morgan. With a cast like that, it has to be an animated film, right? Bingo. 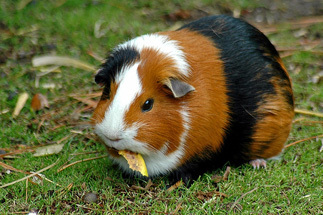 The movie revolves around a team of highly trained secret agent guinea pigs. Think Teenage Mutant Ninja Turtles or Adolescent Radioactive Black Belt Hamsters (why do I know that?) commissioned by the US government to stop an evil billionaire (is there any other kind?) who plans to destroy the world with household appliances. I wonder if that billionaire has his money in the stock market. Maybe he is only a multi-millionaire now given the current state of affairs. Alas, with Nicolas Cage voicing Spreckles the mole, Steve Buscemi as Bucky the hamster, Tracy Morgan as Blaster the guinea pig and Penelope Cruz as Juarez, moviegoers can feel confident that the Earth is in better hands than Allstate can offer. See the latest developments for this project on the G-Force Movie News page.